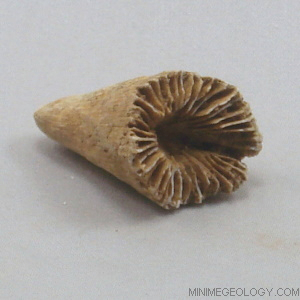 Horn corals are part of the order Rugosa that have a distinct horn shape. Horn corals lived in warm water shallow reefs. You will enjoy collecting this Devonian age (approximately 360 to 410 million years old) fossil. These horn corals were replaced by quartz and collected from Clark County, Indiana. An information card with details on the rock formation, mineral content, characteristics, and uses is included. Typical samples sizes are generally 0.5 to 1.5 inches in length or width but can vary based on availability and natural fossil shape.